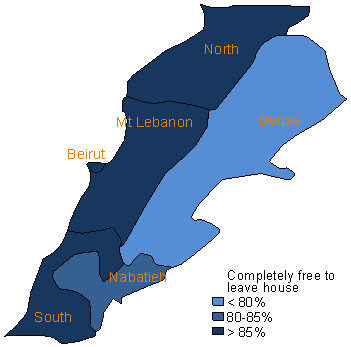 The SWMENA survey investigated the extent to which women in Lebanon felt they enjoyed freedom of movement without pressures from family or society. The survey also examined general attitudes towards violence against women and whether domestic violence, in particular, is tolerated or rejected by society. These topics were covered in an attempt to understand power relations within the family and within society in how it views women. Women’s ability to move freely and safely in public spaces supports their ability to fully participate in the civic, political, and economic life of their communities. Therefore, women in Lebanon were asked how free or restricted they felt in associating with persons of their own choosing; expressing their views on critical issues to family members, neighbors or friends; leaving their house without permission; and moving about in public areas without fear or pressure. Figure 1 shows that 87% of women feel completely free in the choice of people with whom they associate and an additional 9% feel somewhat free. Only 4% of women said they felt somewhat or completely restricted in their choice of associations. A large majority of women (94%) felt completely or somewhat free in moving about in public areas. Most women feel that they can freely express their opinions on critical issues to family members, friends, and neighbors. In terms of leaving their houses without permission, less women report freedom in this aspect. Sixty percent of women feel completely free to come and go from their own home, 21% feel somewhat free, and nearly 1 in 5 (19%) feel somewhat restricted or completely restricted. However, the proportion of women who feel free to leave their houses without permission increases with age (Figure 2) and varies across mouhafazat (Figure 3). Figure 4 shows that when they are outside their homes, more than one-third (35%) of women report that men make unwanted rude, vulgar, or harassing noises and gestured towards them most or every time they venture into public. Another 26% have experienced these harassing behaviors by men, but only rarely. Fewer than 4 in 10 (39%) women have never been subjected to such unwanted behaviors by men. Figure 5 shows that while unwanted physical contact is much less frequent than harassing comments and noises, more than one in five (22%) women have been touched or pinched against their will in public spaces. While few (1%) experience this every time they go out in public, 6% said it happened most times and 15% said rarely. Figure 6 shows that 5% of women experience sexual harassment at work either every day or most days. This included verbal and physical harassment. Five percent report they are subjected to these sorts of behaviors by men once in a while and 14% said rarely. Fortunately, 3 out of 4 women (76%) have never experienced harassment at work.